We are building the next generation cryptocurrency: LAPO Coin (LAX). Stability and speed are its main weapons to break the limits of today’s crypto-world. Coins like Bitcoin and Ethereum are highly volatile. On any given day, it is common to see an increase, or decrease, up to 10-20%. That makes using most cryptocurrencies for daily transactions inconvenient. LAPO Blockchain brings stability with traditional Swiss expertise in financial services to crypto assets worldwide. Multicurrency, desktop and mobile wallet for private. Business oriented/extendable Merchant Portal with business intelligence capabilities and reporting. State-of-art payment API and Plugins that allow an easy integration of payment request in any cryptocurrency. The POS app can be downloaded in any modern device (computer, cell phone or tablet) and will integrate NFC communication support enabling payment with a simple touch or scanning a QR code. Decentralised “wallet-to-wallet” exchange platform to trade AltCoins, LAPO Tokens and LAX. 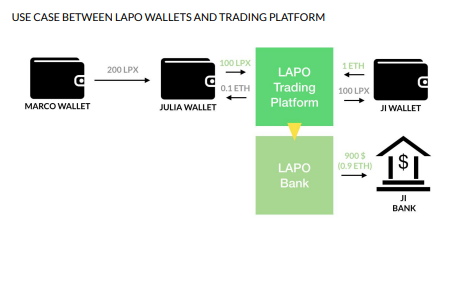 Using the platform and LAPO Bank you can immediately convert your LAX into FIAT assets or other AltCoins for a very low fee. The trading app support multiple monitors and devices.